Mad Skills Motocross 2 from Turborilla takes motocross games to another level. The sequel to the original hit game, this sequel offers a lot more including better gameplay, superior graphics and an inherently addictive nature. Three years have passed since the original appeared, and the improvements this time are significant. Just as in the original game, the controls in Mad Skills Motocross 2 are easy to learn, with arrows on the right indicating where your bike leans, and on the left buttons for braking and acceleration. The mechanism is easy to learn no doubt, but it will take some time before you can master it. 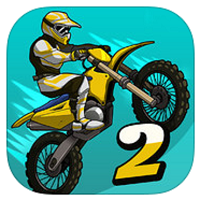 Mad Skills Motocross 2 offers several tracks with different properties, and you’ll need to learn how to bounce along small and large, all the while trying to outrace your opponents. There’s also a very interesting Career Mode and a multiplayer mode called Jam that allows you to go up against other gamers from anywhere in the world. The goal in the Mad Skills Motocross 2 multiplayer is to get the best time and it’s a lot of fun. What makes the game even more challenging is the fact that it’s your skills that will determine your progress and not the rockets. Speaking of those rockets, you get one rocket a day, but you need to make sure that it is used properly and only when needed. All in all, Mad Skills Motocross 2 is a very enjoyable game and provides enough thrills for motocross fans.